Prime Minister Imran Khan on Sunday invited foreign investors to invest in the country, which he said was on upswing following his vision for a “strong and prosperous Pakistan”. 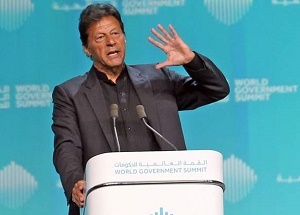 “Pakistan is on the upswing this is the time to come to Pakistan, don’t miss the boat,” the premier said while addressing the 7th World Government Summit in Dubai. PM Imran said his government was pursuing a reform agenda to develop Pakistan on modern lines, which included facilitating ease of doing business, changing tax laws, and encouraging investments. He said Pakistan had the greatest tourism potential and the government was focusing on that sector. Premier Imran said he wanted to follow the example of China and how they were able to end mass poverty in their country. He said the PTI government also believed in investing in human capital of the country to uplift common people. “There is a dire need to establish a welfare state in Pakistan just like the one established by the Holy Prophet (PBUH),” he remarked, adding that the rule of law must reign supreme for Pakistan to prosper. His participation at the annual gathering of heads of states and governments, experts and policymakers, stressed the country’s interest in economic growth and green development.